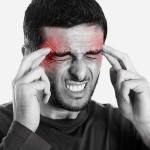 Headache is one of the most common symptoms experienced by many. People are seen irritated due to severe headache, some of them also experience one sided headache, which literally affects their productivity and concentration. People generally pop-in pills to get quick relief which is not considered as a healthy headache relief solution over a long run. Many of them also experience migraine headache, which is one of the worst pains ever. Even Google admits that one of the top most searched query is “How to get rid of headache”? Sabar Healthcare offers various proven Migraine & headache relief solutions. Explore the below listed products for a great health.